Home > Posts > News > Events > Big Booster season 2: accelerate your start-up in Lyon and Boston! 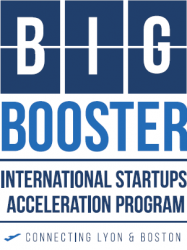 Big Booster is an international acceleration program for start-ups with innovative projects on new markets. After a highly successful season 1, with over 500 applicants, 10 finalists and 3 winners, registration for season 2 will soon be closing. “Fast, effective, grounded in the real world and human” is the feedback from alumni of the first season of Big Booster. Based on a fruitful exchange between two major innovation ecosystems, Lyon and Boston, the program consists of intensive coaching seminars (3-day “booster camps”) enabling start-ups to fast-track their development. From testing and improving their value proposition, strategy and pitch to dedicated mentoring sessions to discovering the Boston ecosystem, the start-ups are immersed in a highly stimulating environment. As the 1st concrete illustration of the partnership agreement between Lyon and Boston, the competition is an opportunity to increase awareness of both cities’ fields of excellence, including digital technology, biotech and cleantech. To attract even more start-ups, namely those from around the world, this year’s application process has been extended to include robotics, smart cities, design and mobility. You too can capitalize on this opportunity to develop your start-up in an innovative ecosystem with help from mentors who are seasoned experts in their industry: sign up for season 2 of Big Booster!